"Bogus" charity collectors are being investigated by the Charity Commission after an undercover report by the BBC. BBC South East looked at three firms who claimed to collect for charity. A reporter filmed one firm collecting in Hastings, East Sussex, and traced goods to Lithuania where a warehouse manager said they were sold for profit. Arthur Lefevre, of Drapers Way, St Leonards, who is now the subject of an inquiry, said criminals hijacked his firm, the Arthur Clothing Company. 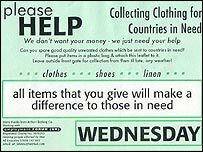 The charity he was collecting for had asked him to stop collections in September, but Arthur Clothing Company was still in operation two months later. The first firm, Kraslava Services Seven Ltd, was registered at a residential east London address where the occupants said they had nothing to do with the business. Kraslava's leaflets said the organisation was commercial, but collectors in Paddock Wood, Kent, told residents cast-offs were for charity - they told the BBC the company was hiring haulage firms to export the clothes. An undercover reporter then gave a jacket containing a satellite tracker to the second firm - the Arthur Clothing Company operating in East Sussex. A signal from the jacket showed goods being taken to an industrial estate in Rye Harbour where the firm rents storage, and then on to Dover and Calais. In France, the signal was lost, but the reporter went to Lithuania where much of Britain's second-hand clothing is sold, and found the lorry in a trailer park in Klaipeda. 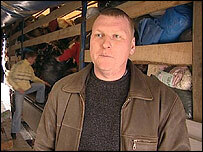 The jacket was taken to a warehouse where manager Darius Kirsys, from Sargma, said he paid £3,000 for the load. "We order the clothes from England. They load a truck and it comes to us. "We count them, store them, give them product descriptions and sort them into ranges, and then it depends." Some of the clothes in the lorry were transported in bags from mainstream charities who confirmed they were not involved in the exports. A third business, Ecotex Collection Ltd, which was running collections in Leybourne, Kent, was found to have a company number that related to a dissolved firm. 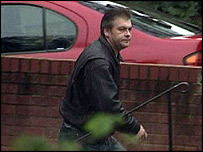 Kent trading standards officers said bogus charity collections were difficult to stop. "They hide behind accommodation addresses. We don't know where goods are actually going and it would take a good deal of time and effort to ascertain that," spokesman David Scott said. "We do our best, but we have limited resources." Charity Commission spokesman, David Rich, said: "These people may be committing criminal offences. They are certainly ripping off charities and bringing the name of charity into disrepute." Company laws say limited companies should "have a registered office to which all communications and notices may be addressed". The Theft Act 1968 makes it illegal to obtain property by deception. Jon Hunt's full report can be seen on BBC South East Today at 1830 GMT on Monday and Tuesday on BBC1.